Familiarize yourself with all the content of the session. Additionally make yourself learn about the Passion and Resurrection of our Lord and Savior Jesus Christ. Visit the website of the Greek Orthodox Archdiocese of America for a wealth of information on this topic. Once the Royal Hours have been completed, have the parishioners exit the Church. The GOYAns (junior high and high school age) will remain in the Church. Have the JOY and HOPE children (Kindergarten through 6th grader) gather in a separate place. To better understand the Crucifixion and the sacrifice Jesus made for us. Let us Pray to the Lord. Lord Have Mercy. Today is hung upon the Cross, He Who suspended the Earth upon the waters (3x). A crown of thorns crowns Him, Who is the King of Angels. He, Who wrapped the Heavens in clouds, is clothed with the purple of mockery. He, Who freed Adam in the Jordan, received buffetings. He was transfixed with nails, Who is the Bridegroom of the Church. He was pierced with a lance, Who is the Son of the Virgin. We worship Your Passion, O Christ. We worship Your Passion, O Christ. We worship Your Passion, O Christ. Show us also, Your glorious Resurrection. Have the young people and youth advisors/workers gather around the Cross. 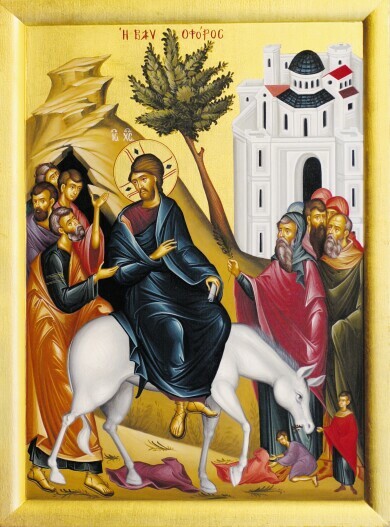 (If the church is unavailable due to the decoration of the Kouvouklion, use an icon of the Crucifixion.) Wait until it is completely silent before beginning the session. Ask the young people to remain silent and place their focus upon Jesus on the Cross. The Priest or Group Leader (Youth Director, Advisor, Parent) should stand off to the side so that the focus is not on them ø but rather on the Cross. After a moment of silence, read the following scripture passage reverently and slowly. And those who passed by blasphemed Him, wagging their heads and saying, You who destroy the temple and build it in three days, save Yourself! If You are the Son of God, come down from the cross. Likewise the chief priests also, mocking with the scribes and elders, said, He saved others; Himself He cannot save. If He is the King of Israel, let Him now come down from the cross, and we will believe Him. He trusted in God; let Him deliver Him now if He will have Him; for He said, ÔI am the Son of God.' Even the robbers who were crucified with Him reviled Him with the same thing. Now from the sixth hour until the ninth hour there was darkness over all the land. And about the ninth hour Jesus cried out with a loud voice, saying, Eli, Eli, lama sabachthani?' that is My God, My God why have You forsaken Me? Some of those who stood there when they heard that, said, This Man is calling for Elijah! Immediately one of them ran and took a sponge, filled it with sour wine and put it on a reed, and offered it to Him to drink. The rest said, Let Him alone; let us see if Elijah will come to save Him. And Jesus cried out again with a loud voice, and yielded up His spirit. Now that you have heard from Scripture the account of Jesus' Crucifixion, we want you to listen to the following medical description of what took place.This is what Jesus experienced on the Cross. Have the youth remain silent, keeping their focus on the Cross. Why would Jesus willingly go through this much pain and suffering for us? What were you thinking when this explanation was read? Ask the group to place their index finger on the place where the nail went into the wrist. Is that part of the body tender? Pass the nail around and have each member of the group hold it for a few second each. Can you imagine the nail going through the wrist? Can you imagine the pain and suffering that Jesus went through? Once again, read Matthew 27:39-50. Tell the group to listen to it in a new way ø in a way they have never thought of before. When the thief beheld the Author of Life hanging on the Cross, he said: ÔIf He, who was crucified with us, was not God incarnate, the sun would not have hidden its rays, neither would the earth have quaked with trembling. But, all-forbearing Lord, remember me in Your Kingdom. To illustrate how Jesus allowed Himself to be crucified because of His deep love for us. When You were crucified, O Christ, tyranny was destroyed and the power of the enemy was trampled upon. For it is neither an angel nor a man, but the Lord himself who saves us. Glory to You. Once there were two identical twins named John and Peter. They looked so alike that even their closest friends could not tell them apart by their looks. But look was the only way they were alike. They certainly didn't act alike. John was the perfect child. He always obeyed his parents; he was kind to other people; he studied hard in school; and he had high moral standards and values. Peter on the other hand, was a different story. He was constantly being disobedient to his parents; he mistreated other kids; he lied; he took things that didn't belong to him; and he was always in trouble. He was continually breaking his parent's hearts. As John and Peter grew older, the differences between them also grew. John continued to be the model student, applying himself and excelling in everything he did. Peter, however, got into deeper and deeper trouble. He began to have run-ins with the law. First it was for minor offenses like traffic violations and truancy. But the older he got the more serious the trouble became. He was in and out of jail as a teenager, then as a young adult he committed the ultimate crime. He killed someone and was found guilty of first-degree murder and was sentenced to die in the electric chair. He was placed on death row. Finally, he exhausted all the appeals and the execution date was set. The day before he was to die, John came to visit him on death row. The guard opened Peter's cell and let John in and then walked away. Immediately John began taking off his clothes and told Peter to do the same. John then put on Peter's clothes and had Peter put on his. A few minutes later the guard came back to let John out of the cell, but instead it was Peter who walked out, down the hall and out the door to freedom. The next day they came to take Peter to the electric chair, without realizing he was actually John. They walked him down the hall to the electric chair, strapped him in and ended his life. Peter was free, but he had a decision to make. He could either continue to live his life like he had always lived it ø chances were he would be discovered and end up back on death row. Or he could take on John's lifestyle and try to imitate his life. Have them discuss this story using the following question which can be found on the attached hand out. Why do you think John did what he did? Was it a good choice? What do you think Peter will do? Why do you think Peter will do this? Raise your hand if you thought Peter would turn his life around? How many of you thought Peter would continue down his troubled path? How many of you thought John made the right decision? How many of you thought John made the wrong decision? Do you know anyone who has taken someone else's punishment? Remember earlier we were thinking about Him on the Cross. Why would He do this for us? Is dying for our sins the most important thing about Pascha? How many of you think Jesus would allow Himself to be crucified even if you were the only sinner on earth? Knowing all that He has done for us, what are we going to do to make a change like Peter? Hand everyone a piece of paper, an envelope and a pen. Have participants write letters to God. They should list what they can do differently to show that Christ's Crucifixion and Resurrection affected their lives. What would they change knowing that they have a second chance? When time is finished, collect letters in sealed self-addressed envelope to be mailed to participants next week as a reminder of what they were hoping to achieve after Pascha. You see, although it is Friday afternoon and tomorrow night we will be singing the beautiful hymn, Christ is Risen! it isn't too late. In a short while, Christ will be taken down from the Cross and placed in the tomb. He will descend into Hades for He has defeated death. And by now you understand what that means and that He did it for you too. Use the rest of your life to show God that you are grateful for what He did. Start right now! If you're not sure how to begin, use the tools the Church gives us: participating in the Sacraments, fasting, praying and giving. It isn't too late. Make this Easter one that will change the rest of your life. O Christ our God who at all times and at every hour are worshiped and glorified both in heaven and on earth, who are long in patience, great in mercy and compassion, who love the righteous and show mercy to sinners, who call all to salvation through the promise of good things to come; receive our prayers at the present time. Direct our lives according to your commandments. Sanctify our souls. Purify our bodies. Set our minds aright. Cleanse our thoughts and deliver us from all sorrow, evil and distress. Surround us with your holy angels, that guarded and guided by them, we may arrive at the oneness of the faith and the comprehension of your ineffable glory. For you are blesses to the ages of ages. Amen. Clean church: dust, vacuum, clean windows, polish pews, etc. To illustrate how we use our hands (actions) to express our love for God and each other. Our Father, who art in heaven, hallowed be Thy name. They kingdom come. They will be done, on earth as it is in heaven. Give us this day our daily bread; and forgive us our trespasses, as we forgive those who trespass against us; and lead us not into temptation, but deliver us from evil. For Yours is the kingdom, the power and the glory of the Father and the Son and the Holy Spirit, now and forever. Amen. Break the group up by age, approximately four to five children per group. Each group should be given a large piece of butcher paper and different colored crayons or markers. Ask the groups to draw different types of hands: mechanics, doctors, pianists, painters, mothers and fathers. Give them 15 minutes to do this and after they have finished, have each group present what they have done to the other groups about their hands. Have them explain why they made some hands different than others. How do all the hands look alike? How do they look compared to your hands? Which hands are most beautiful and why? Two girls worried how they could have pretty hands. They were using the most expensive perfumes and lotions, and were spending much time to make their hands beautiful. One day, however, when the two girls were standing at the foot of a hill, another girl came along. This girl listened to their conversation about their hands and she looked at her own hands: They were calloused from hard work, ugly, and very dry. The two girls also looked at her hands and laughed in ridicule. Just then a very old lady, dressed in ragged clothes as passing by. She asked if one of the tree girls would help her carry her heavy load up the hill where she was going. The two girls with the beautiful hands were not willing even to touch her rough sack. The other girl with the ugly hands picked up the sack and started off with the old lady. At the top of the hill, the girl with the ugly hands and the old lady stopped, and the old lady, now in the form of an Angel, took the hands of the girl who carried the heavy load for her and said: The prettiest hands, my daughter are the hands that help others. Whose hands were the most beautiful in the story and why? If an Angel came down from heaven, what would he see by looking at your hands? What are nice things that you like to do with your hands? What do Jesus' hands look like? Why does He have holes in His hands? We have learned that it is not what is on the outside ø but what is in our hearts that matters most. Doctors heal us with their hands, Moms hug us with their hands, the priest blesses us with his hands. Remember, what you do with your hands shows what is in your heart. Let Christ's love shine through all your works. Let my prayer be set forth before you as incense and the lifting up of my hands as an evening sacrifice. Hear me O Lord. Amen. Your cross, O Lord, is life and resurrection to your people, and putting our trust in it, we praise you, our crucified God. Have Mercy on us. Once there were two identical twins named John and Peter. They looked so alike that even their closest friends could not tell them apart by their looks. But look was the only way they were alike. They certainly didn't act alike. John was the perfect child. He always obeyed his parents; he was kind to other people; he studied hard in school. Peter on the other hand, was a different story. He was constantly being disobedient to his parents; he mistreated other kids; he lied; he took things that didn't belong to him; and he was always in trouble. Peter, however, got into deeper and deeper trouble. When he was at Wal-Mart he stole some candy and he was caught. The store security guard picked him up and called his parents. His parents came to the store and picked him up. Angry his parents took him home and sent him to his room so that they could think about the best punishment for him. While their parents were talking, John went into Peter's room and insisted they switch places. When their parents came in, they were really giving a punishment to John not Peter. They decided that he would not be able to use the computer or watch television for 2 weeks in addition he would have to do all of John's chores. John gladly took the punishment for Peter because he loved him. Peter had a decision to make. He could either continue to live his life like he had always lived it which means he would eventually end up with many if not more of the punishments that John got or he could try to learn from his brother's example. Hand everyone a piece of paper, an envelope and a pen. Have participants write letters to God. They should list what they can do differently to show that Christ's Crucifixion and Resurrection affected their lives. What would they change knowing that they have a second chance? When time is finished, collect letters in sealed self-addressed envelope to be mailed to participants next week as a reminder of what they were hoping to do after Pascha. For the Hope children, have them draw a picture of how Christ's Crucifixion and Resurrection affected their lives. Gather everyone together and say: Today we have been given another opportunity to change for the better. On Saturday night, Easter morning, after the services are over, your priest will read a sermon that was written 1600 years ago but its message is true today, God is gracious; He accepts the last even as the first You see, although it is Friday afternoon and tomorrow night we will be singing the beautiful hymn, Christ is Risen! it isn't too late. In a few minutes (hours) Christ will be taken down from the cross and placed in the tomb. And by now you understand what that means and that He did it for you too. Use these next few hours, (days) to show God that you are grateful for what He did. If you don't know how, use the tools the Church teaches: (even if you haven't yet) you can still fast, pray, give, prepare! It isn't too late. You were lifted up upon the cross of your own free will, Christ our God. Grant your mercy upon your people who bear your name. In your strength make glad the Orthodox giving them victory over their adversaries. May they have your alliance as a weapon of peace, and an invisible trophy. Assemble gift basket for shut-ins with icons, cards, candles, baked goods, Etc.